The use of organometallic reagents in organic synthesis had its beginning around 1900 with the work of Victor Grignard, who discovered that alkyl and aryl halides reacted with magnesium metal to give homogeneous solutions. The “Grignard reagents” proved to be reactive carbon nucleophiles and have remained very useful synthetic reagents since that time. Organolithium reagents came into synthetic use somewhat later. In the last 25 years, the synthetic utility of reactions involving metal ions and organometallic compounds has expanded enormously. Certain of the transition metals, such as copper, palladium, and nickel, have gained important places in synthetic methodology. In addition to providing reagents for organic synthesis, the systematic study of the reactions of organic compounds with metal ions and complexes has created a large number of organometallic compounds, many having unique structures and reactivity. In this chapter, we will discuss the Grignard reagents and organolithium compounds. 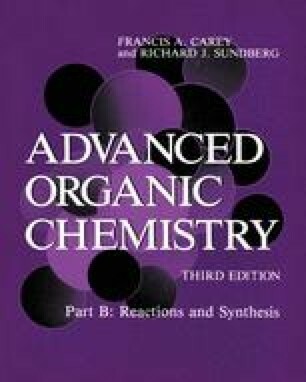 In Chapter 8, the role of transition metals in organic synthesis will be given attention.